North Africa, Northern Africa is the northernmost region of the African continent, linked by the Sahara to Sub-Saharan Africa. Geopolitically, the United Nations definition of Northern Africa includes seven countries or territories; Algeria, Egypt, Libya, Morocco, Sudan, Tunisia, and Western Sahara. Algeria, Morocco, Tunisia, Libya and often Mauritania are the Maghreb or Maghrib, while Egypt and Sudan are referred to as Nile Valley. Egypt is a transcontinental country by virtue of the Sinai Peninsula, which is in Asia. North Africa also includes a number of Spanish possessions, Ceuta and Melilla (tiny Spanish exclaves or islets off the coast of Morocco). The Canary Islands and the Portuguese Madeira Islands, in the North Atlantic Ocean northwest of the African mainland, are sometimes included in considerations of the region. The distinction between North Africa and much of Sub-Saharan Africa is historically and ecologically significant because of the effective barrier created by the Sahara. Throughout history this barrier has culturally separated the North from large parts of the rest of the continent. As the seafaring civilizations of the Phoenicians, Greeks, Romans and others facilitated communication and migration across the Mediterranean, the cultures of North Africa became much more closely tied to Southwestern Asia and Europe than Sub-Saharan Africa. The Islamic influence in the area is significant, and North Africa, along with Somalia, Djibouti and the Middle East, is also a part of the Arab World. Some researchers have postulated that North Africa, and not East or South Africa, was the original home of the modern humans who first trekked out of the continent. The Atlas Mountains, which extend across much of Morocco, northern Algeria and Tunisia, are part of the fold mountain system that also runs through much of Southern Europe. They recede to the south and east, becoming a steppe landscape before meeting the Sahara desert, which covers more than 75% of the region. The sediments of the Sahara overlie an ancient plateau of crystalline rock, some of which is more than four billion years old. Sheltered valleys in the Atlas Mountains, the Nile valley and delta, and the Mediterranean coast are the main sources of good farming land. A wide variety of valuable crops including cereals, rice and cotton, and woods such as cedar and cork, are grown. Typical Mediterranean crops, such as olives, figs, dates and citrus fruits, also thrive in these areas. The Nile Valley is particularly fertile, and most of the population in Egypt and Sudan lives close to the river. Elsewhere, irrigation is essential to improve crop yields on the desert margins. The inhabitants of North Africa are generally divided in a manner roughly corresponding to the principal geographic regions of North Africa: the Maghreb, the Nile Valley, and the Sahara. 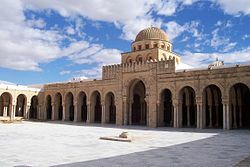 Northwest Africa on the whole is believed to have been inhabited by Berbers since before the beginning of recorded history, while the eastern part of North Africa has been home to the Egyptians and Nubians. Ancient Egyptians record extensive contact in their Western desert with people that appear to have been Berber or proto-Berber. The official language or one of the official languages in all of the countries in North Africa is Arabic. The largest ethnic groups in North Africa are the Arabs and Berbers. North Africa is predominantly Muslim, with Christian and Jewish minorities. Listed here are the human Y-chromosome DNA haplogroups in main countries of North africa. The people of the Maghreb and the Sahara regions speak various dialects of Berber and Arabic and almost exclusively follow Islam. The Arabic and Berber groups of languages are distantly related, both being members of the Afro-Asiatic family. The Sahara dialects are notably more conservative than those of coastal cities (see Tuareg languages). Over the years, Berber peoples have been influenced by contact with other cultures. Nubians, Greeks, Phoenicians, Egyptians, Romans, Vandals, Arabs, and lately Europeans. The cultures of the Maghreb and the Sahara therefore combine indigenous Berber, Arab and elements from neighboring parts of Africa and beyond. In the Sahara, the distinction between sedentary oasis inhabitants and nomadic Bedouin and Tuareg is particularly marked. The diverse peoples of the Sahara are usually categorized along ethno-linguistic lines. In the Maghreb, where Arab and Berber identities are often integrated, these lines can be blurred. Some Berber-speaking North Africans may identify as "Arab" depending on the social and political circumstances, although substantial numbers of Berbers (or Imazighen) have retained a distinct cultural identity which in the 20th century has been expressed as a clear ethnic identification with Berber history and language. Arabic-speaking Northwest Africans, regardless of ethnic background, often identify with Arab history and culture and may share a common vision with other Arabs. This, however, may or may not exclude pride in and identification with Berber and/or other parts of their heritage. Berber political and cultural activists for their part, often referred to as Berberists, may view all Northwest Africans as principally Berber, whether they are primarily Berber- or Arabic-speaking (see also Arabized Berber). The Nile Valley through northern Sudan traces its origins to the ancient civilizations of Egypt and Kush. The Egyptians over the centuries have shifted their language from Egyptian to modern Egyptian Arabic, while retaining a sense of national identity that has historically set them apart from other people in the region. Most Egyptians are Sunni Muslim and a significant minority adheres to Coptic Christianity. In Nubia, straddling Egypt and Sudan, a significant population retains the ancient Nubian language but has adopted Islam. The Republic of the Sudan is home to a largely Arab Muslim population, although there remains significant non-Arab (through Muslim) populations in the far north (Nubians), far west (Fur, Masalit and Zaghawa) and far south (Nuba) of Sudan. The first Roman emperor native to North Africa was Septimius Severus, born in Leptis Magna in present-day Libya. North Africa remained a part of the Roman Empire, which produced many notable citizens such as Augustine of Hippo, until incompetent leadership from Roman commanders in the early fifth century allowed the Germanic barbarian tribe, the Vandals, to cross the Strait of Gibraltar, whereupon they overcame the fickle Roman defense. The loss of North Africa is considered a pinnacle point in the fall of the Western Roman Empire as Africa had previously been an important grain province that maintained Roman prosperity despite the barbarian incursions, and the wealth required to create new armies. The issue of regaining North Africa became paramount to the Western Empire, but was frustrated by Vandal victories. The focus of Roman energy had to be on the emerging threat of the Huns. In 468 AD the Romans made one last serious attempt to invade North Africa but were repelled. This perhaps marks the point of terminal decline for the Western Roman Empire. The last Roman emperor was deposed in 476 by the Heruli general Odoacer. Trade routes between Europe and North Africa remained intact until the coming of Islam. Some Berbers were Christians (but evolved their own Donatist doctrine), some were Jewish, and some adhered to their traditional polytheist religion. African pope Victor I served during the reign of Roman emperor Septimius Severus, of Roman/Berber ancestry. The Byzantine reconquest of North Africa from the Vandals began in 533 AD, as Justinian I sent his general Belisarius to reclaim the former Roman province of Africa. In 2010 - 2011 massive protests swept the region leading to the overthrow of the governments in Tunisia and Egypt, as well as civil war in Libya. Large protests also occurred in Algeria and Morocco to a lesser extent. Many hundreds died in the uprisings. In 2010, Chad, Niger and Sudan all recorded their hottest all-time temperatures on record. In Chad, the temperature reached 47.6°C (117.7°F) on June 22 in Faya-Largeau, breaking a record set in 1961 at the same location. Niger tied its highest temperature record set in 1998, on also June 22, at 47.1°C (116.78°F) in Bilma. That record was broken the next day, on June 23 when Bilma hit 48.2°C (118.8°F). The hottest temperature recorded in Sudan was reached on June 25, at 49.6°C (121.3°F) in Dongola, breaking a record set in 1987. ^ According to UN country classification here: http://millenniumindicators.un.org/unsd/methods/m49/m49regin.htm. The disputed territory of Western Sahara (formerly Spanish Sahara) is mostly administered by Morocco; the Polisario Front claims the territory in militating for the establishment of an independent republic, and exercises limited control over rump border territories. ^ a b "ALGERIA". The World Factbook. CIA. https://www.cia.gov/library/publications/the-world-factbook/geos/ag.html. ^ "LIBYA". The World Factbook. CIA. https://www.cia.gov/library/publications/the-world-factbook/geos/ly.html. ^ "Site institutionnel du Haut-Commissariat au Plan du Royaume du Maroc". http://www.hcp.ma/. ^ "MOROCCO". The World Factbook. CIA. https://www.cia.gov/library/publications/the-world-factbook/geos/mo.html. ^ "SUDAN". The World Factbook. CIA. https://www.cia.gov/library/publications/the-world-factbook/geos/su.html. ^ "TUNISIA". The World Factbook. CIA. https://www.cia.gov/library/publications/the-world-factbook/geos/ts.html. ^ Estimate based on the 2004 Moroccan census. No census specific to the borders of the territory since 1975. ^ "WESTERN SAHARA". The World Factbook. CIA. https://www.cia.gov/library/publications/the-world-factbook/geos/wi.html. ^ "The World Factbook". CIA. https://www.cia.gov/library/publications/the-world-factbook/index.html. Retrieved 2011-02-11. ^ C. Michael Hogan (December 18, 2007). "Volubilis - Ancient Village or Settlement in Morocco". The Megalithic Portal. http://www.megalithic.co.uk/article.php?sid=14906. Retrieved 2010-05-23. ^ Kung, Hans (2006). Tracing the Way: Spiritual Dimensions of the World Religions. Continuum International Publishing Group. p. 248. ISBN 978-0-8264-9423-8. http://books.google.com/?id=sm0BfUKwct0C&pg=PA248&dq=kairouan+oldest+mosque+north+africa#v=onepage&q=kairouan%20oldest%20mosque%20north%20africa&f=false. ^ Essa, Azad (February 21, 2011). "In search of an African revolution". Al Jazeera. http://english.aljazeera.net/indepth/features/2011/02/201122164254698620.html. ^ Masters, Jeff. "NOAA: June 2010 the globe's 4th consecutive warmest month on record". Dr. Jeff Masters' WunderBlog. Weather Underground. http://www.wunderground.com/blog/JeffMasters/comment.html?entrynum=1544. This page uses content from the English language Wikipedia. The original content was at North Africa. The list of authors can be seen in the page history. As with this Familypedia wiki, the content of Wikipedia is available under the Creative Commons License.